I had to work this year on Halloween and sadly missed all the fun. But, I do get to enjoy the candy while skipping the long walk to get it. The challenge this week was to do a Halloween tile. I confess, I quite enjoyed this one. I enjoy them all but this one was fun to explore. Which image to put forward? Which tangles are "scary"? I started looking over Halloween themed clip art for my image and went from there. I couldn't choose which I wanted to do more so I did them both. The eyes came out great I think. I had to fight myself to leave the white space. They don't float out of the space as I had imagined them to but I don't mind. While working on this one, the pattern for Pweeko came across my feed and I tried it out. I like it. I've already added it to my tangle "stash". 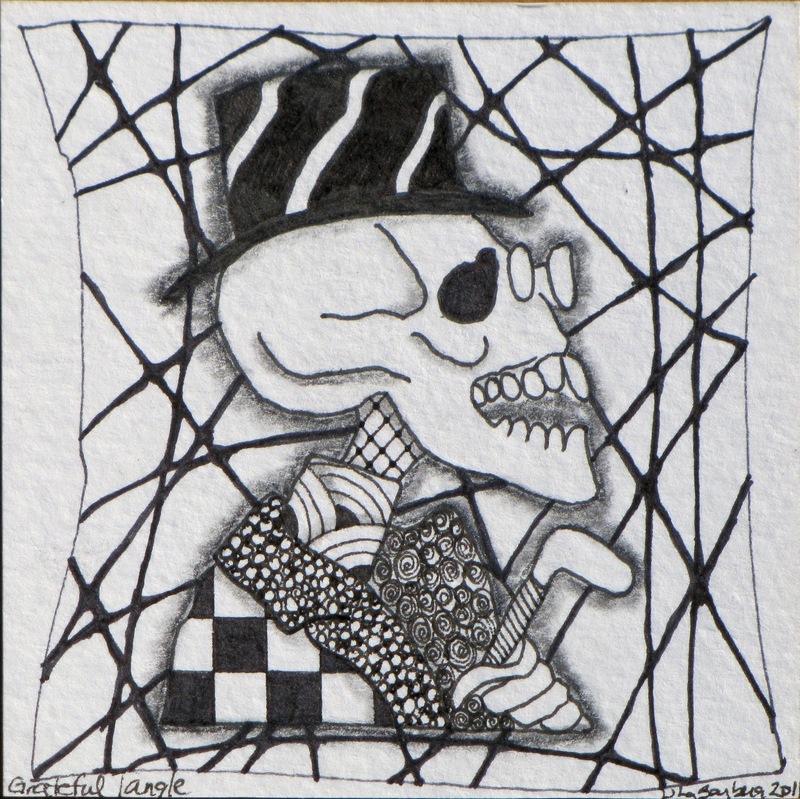 Next, I wanted to do something a bit more obviously Halloween and went with a skeleton. I now think that it is a bit more Grateful Dead than Halloween but I don't mind. That is why it's called "Grateful Tangle". I really left more white space than I have been lately and I'm really glad that I did. I'm not sure what the background tangle is called. It reminds me of Nzepple. It hints at spider webs to me. I hope that you all had a fun, safe and Happy Halloween. The busy time of the year is about to kick off for me at work so I hope to still work on the challenges. I really look forward to them each Monday morning and it's nice to have a direction to head in when I pick up my pens. These tiles are great fun! I love the spooky eyes, and am glad you left the white areas, it really makes the eyes haunt! Thank you for being a follower of my blog. I like both of them and those are so unique! Well done! Both are very cool - this was a fun challenge to kind of slip out of the usual 'string' method. Your eyes are great and I "get" the mask...very cool! I love both of your tiles! I noticed Kandysnake, which is one of my favorites, and thought, "how perfect for Halloween!" Then as I read your comments, I saw you mention Pweeko. I thought, "Uh-oh! That's what I named my new tangle! Was there already a tangle I didn't know about named Pweeko?!" But then, of course, there it was, RIGHT NEXT to Kandysnake! You have no idea how excited I am that someone has used and likes my new tangle! It is the first one I have shared on a public forum. 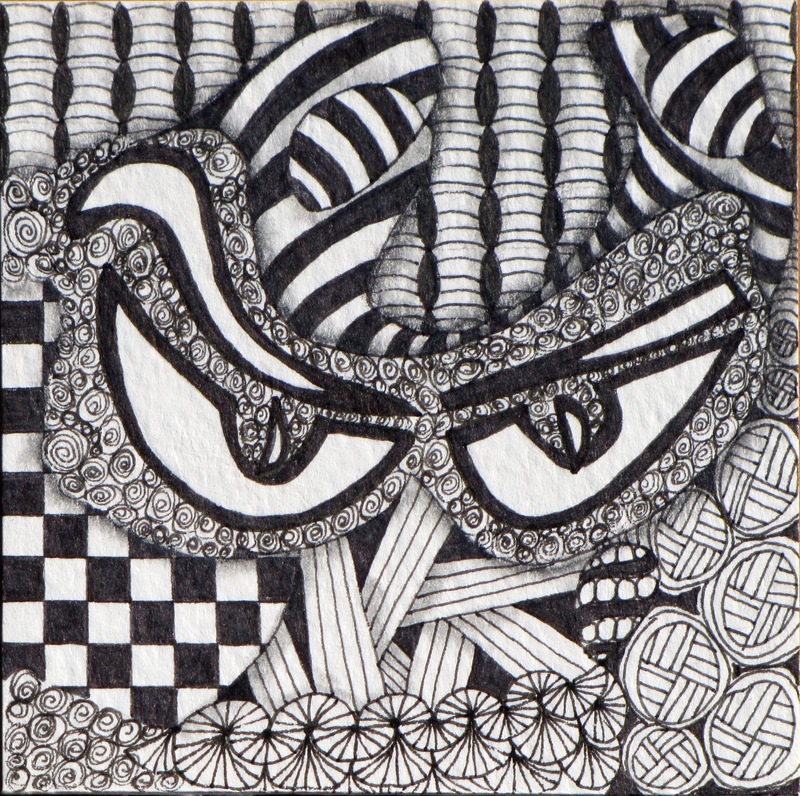 And yours is the first Zentangle tile I have seen that employs it. Cool. THANK YOU!!! Wow! I love both of these! The are different than all the others and both really pop!